It goes without saying that architects, designers and artist have a love affair with pens, or is it just me? I have TONS of pens of every shape and sizes, every cost cheap to uber expensive. I even have a passion for antique fountain pens (and have many stained shirts to prove it). But this entry isn’t about my fascination with fountain pens (I’ll bore you with that post later). 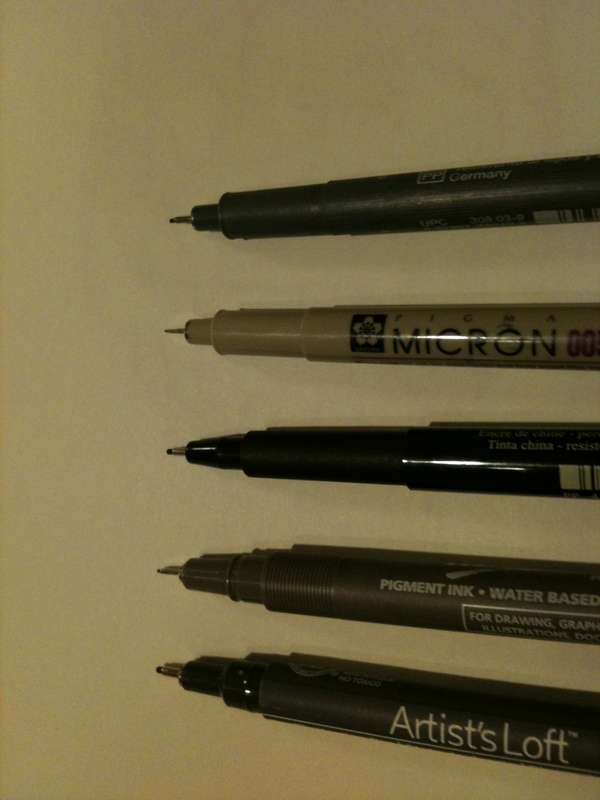 No, this post is about my need to find a proper pigment pen AKA: Micron, which is one of the pigment pens of choice for architects (and a very, very good pen). Wanting to “try before you buy” means you are typically limited to where we can buy these types of pens, and I buy mine at the local Michaels or Plaza Arts store, they carry several different types of pen brands of all shapes and prices. Having purchased all of the different brands they sell, I would like to offer my critique on which pen is my “pen of choice”. Bare in mind I am a very picky pen buyer, what I am trying to find a pen that is an affordable but also a pen that lays down a good “true black” line not a watered down line, but a nice deep black line that holds well to various papers (though I mostly draw in the obligatory “Moleskine” sketchbook). The following suspects are five different brands I have purchased over the last year from Michaels (and their approx cost). Note: there are plenty of other pigment pens out there (and I’d like to know your suggestions and favorite) but these are based on how quickly I burn through pens and how much bang I get for my buck (hey, I’m cheap, ok). So these are the handful of pigment liner pens I own and I judge pens in by the ink color, bleed free factor, comfort and as trivial as this sounds but how that cap is held on the pen. By looking at the pens it’s obvious that the Helix it fails on the “cap hold” test, because there is no real area to clip the cap to so where do you put the cap while drawing? Set it aside? Drop it? Forget where you put it and watch your investment (albeit the lesser of investments) dry up and end up throwing them out. Color of the ink is the most important gauge to me, with any good pigment pen most people are looking for, BLACK, needs to be black, true and deep black that lays down clean bleed free black lines. 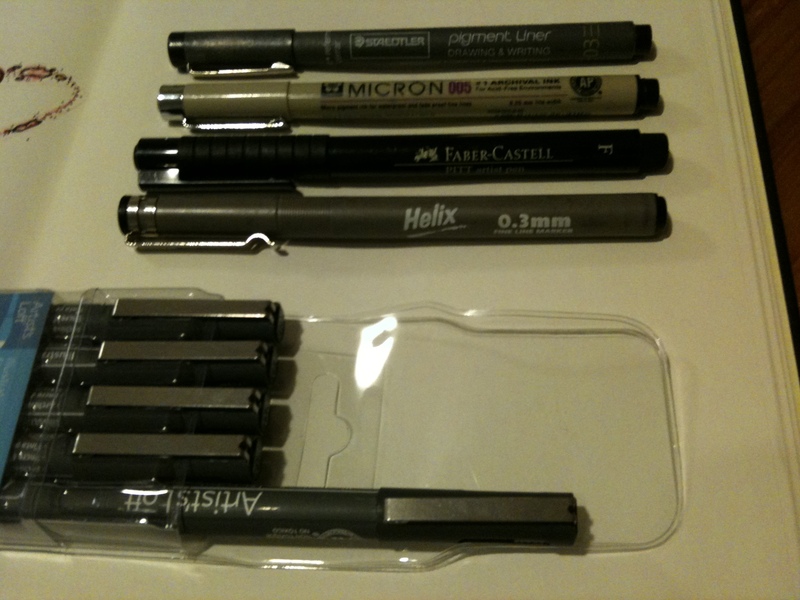 All of the pens are good for the bleed free factor however; the Helix pens are a bit gray, nothing in the rich black range so the pens that haven’t dried out don’t give you the rich black lines you look for in a pigment pen. Comfort is as important in any writing utensil as it is with a pigment pen for me it is really important because the way I hold the pen is close to the nib and most drawings pens are squared off (in a round sort of way) so when it’s squared off it drives into my fingers and makes for an uncomfortable and very short sketching session. So in this category the Faber-Castell and the bargain Artist’s Loft pens were far better for a comfortable drawing experience with the edge going to bargain pen “Artist’ s Loft”. Oh, I noticed on the way out that they started carrying the Copic and PrismaColor brand pigment sketching pens, I’ll report back on those pens once I buy them without my wife knowing about it, she for some reason feels I don’t need any more pens.